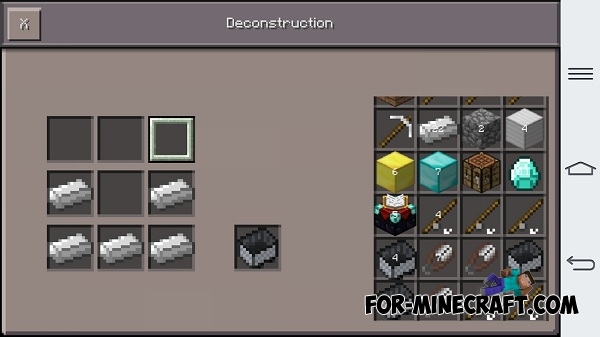 Deconstruction mod adds unusual crafting table to the game, the crafting going in reverse. For example, if you have an iron pick, you can open workbench, to put a pickaxe into the slot and get items from the recipe. At the same time pickaxe disappears. This especially can be useful if your item has few strength. 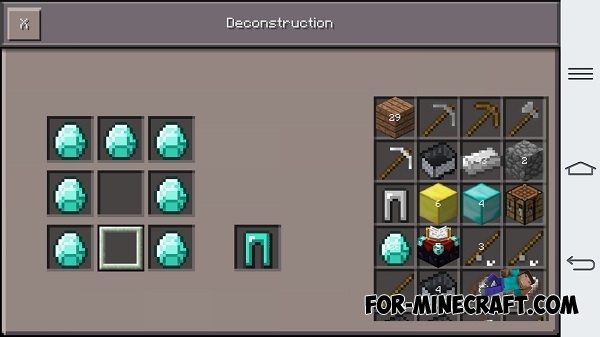 Deconstruction (ID: 23) - Iron bar + diamond + crafting table. Wizard Staff mod for Minecraft Pocket Edition 0.10.5Modification of the "Wizard Staff" gives you access to the magic stick, allows you to make magic with the help of tricks.